Education is the most important factor that defines our lives. Education and learning is the key to advancement. When it comes to college education it becomes all the more critical to select the right course and right form of learning. There are so many students that want to take up a college degree but are unable to do so for a number of reasons. This is where distance education has a role to play. The freedom to learn at will, choose the subjects of one's choice and take examinations without the stress of severe competition makes the distance education programme very attractive. The convenience of the system has made it possible for those unable to compete for the regular courses, to have an alternative route. It is also suitable for students who are working and have missed the opportunities of attaining higher education due to social or economic constraints, and wish to supplement their educational qualifications. In addition, the cost effectiveness of the distance education programmes has been a crucial factor in the popularity of what is called "classroom without walls". Distance Education is a process to create and provide access to learning when the source of information and the learners are separated by time and distance, or both. In other words, distance learning is the process of creating an educational experience of equal qualitative value for the learner to best suit their needs outside the classroom. The success of distance education (DE) is based on a three-way partnership between the student, faculty member and technology. Moreover, it is important to note that the validity of the degree acquired through distance learning is the same as that of a regular degree, as long as the basic eligibility requirements are satisfied. Distance learning (education) is a modern system of non- formal education. There are different terms used for distance learning which include Distance Education, Open Education, Open Learning etc. Distance education is provided by full-fledged independent universities. Any university worth the name of an Open University or distance university must have multi-media facilities. And, in fact, by using these technologies, particularly audio-video, radio and television, teachers can and do provide classes to the students. Learning is imparted through correspondence or postal courses, contact, electronics media like radio, television, video and audio cassettes etc. and other audio - visual aids. *Conduct examinations. Most of the universities now provide facility of “examination on demand”. In this candidate can take exam on his chosen date and online or in a study center. In this, the student does not have a direct face to face contact with the teacher, but can use various modes to access education, like e-learning, video conferencing, e-mail, etc.In this mode of education, the student is not required to attend the classes regularly, and the evaluation of his research work is done through the tests conducted at regular intervals. Distant education institutes offer the course guidelines and recommend a study method once admission is secured in the institute. Library facilities and online information are also available for a few professional courses. One can study the subject according to his or her own convenience but has to appear for the exam or test decided by the university before receiving a degree. Practically every university has a department of Distance Education. The better known include – Delhi University School of Open Learning, Annamalai University, Jamia Hamdard Open & Distance learning, Osmania University, Kurukshetra University, and others. 2.Open Universities- An Open University is one which offers open entry for admissions for distance and online learning programmes. In an open university there are no affiliated colleges and comprises of only study centers and institutes. Open universities offer distance learning programs for students across the country and open to any person who may not possess any formal qualifications. The main purpose of an open university is to provide education to those who cannot take admissions in the traditional university, i.e. working people or those living in the remote areas. Open universities offer flexible course options that allow those who may not have a formal qualification but have reached the minimum age requirement of 18-20 years for first degree courses. Enrolment in some courses is subject to qualifying in a written exam but the admission process and qualifying criteria is simpler than those offered by regular universities. Moreover the courses can be taken at the student’s pace. These universities are present in nearly every state and offer graduate, postgraduate, M Phil and PhD courses, as well as diploma and certificate courses, in a wide variety of subjects from commerce, history, Economics and all the sciences to Business Management, Law, Library Science, Journalism, Computers, Biotechnology, Agriculture and so on. Some Open Universities include : IGNOU, Yashwantrao Chavan Maharashtra Open University, Nashik, Dr. B.R. Ambedkar Open University, Nalanda Open University, Tamil Nadu Open University. 3. Private institutions that offer distance learning programmes: Several private universities have begun extending their education and infrastructure facilities to larger numbers of students through the distance education mode. In this way the popular courses offered by such universities are accessible to more students, and at more economical cost. Students also benefit by way of relevant courses, less competitive admission system, as well as effective innovative methods of learning such as online trainings, recorded video and animated lectures. Some private universities have also worked out tie ups with foreign universities and other institutes in areas of curriculum development, student exposure programme and even faculty. Such educational collaborations enhance knowledge and skills of students. Private Universities offering distance learning programmes include : Symbiosis Center for Distance Learning, Manipal University, Sikkim Manipal University, Amity University, ICFAI and others. Massive Open online course (MOOC). In addition to university style education there are also Online courses that help students enhance and upgrade their education. The best known are the MOOCs online courses aimed at unlimited participation and open access via the web. In addition to traditional course materials such as filmed lectures, readings, and problem sets, many MOOCs provide interactive user forums to support community interactions among students, professors, and teaching assistants. It does not always quantify as formal education but provides a platform to study quality courses from institutions offering them, usually for free. The EDX website, founded by Harvard University and MIT is one of the largest providers of Free Massive Open Online Courses (MOOC) offered by Top universities and colleges, and includes courses from universities such as Berkeley, Boston, Columbia University, IIT Bombay, University of Queensland and many more. There are others E- Learning courses on the internet from reputed international Universities and India that will help you to broaden your thinking, add to one’s skill sets, and even provide you with relevant training to leg up in one’s career. And whether you are interested in Computer science, Languages, Engineering, Psychology, Electronics, Biology or Marketing, MOOCs has course for you. These learning portals are packed with free, high quality courses – both certificate and diploma – in over 100 categories, having subjects such as Art, business, finance, maths, management, vocational training. All these courses are self-paced, so one can study whenever one wants. Once you found a subject you want to study, register for a free account and click on ‘start course’ button. One can take assessment and re-assessment anytime but requires 80% or over to pass. *Flexibility –Distance education offers flexibility of time & Admission. One can choose your own timing. One can continue a job and study at the same time. It also provides flexibility with regard to the number of years in which one can complete the course. *Open universities do not restrict a student from taking admission on the basis of his/her age. *It is economically viable though the standard of education provided by open universities is as good as that provided by conventional universities. ¿ Distance education is an alternative to those who live in a geographically challenged area. There are people in India or in many other countries who live in areas located away from any good university or a college. There are thousands of distance learning programmes and those looking at such an education need to be selective and focused. Check the credibility and recognition of the courses and institutes and choose courses that match your own career goals. Choose a well-recognized institution for your distance education course. 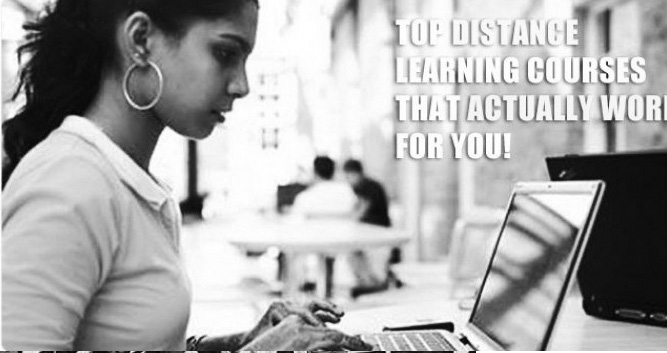 Admission to distance learning courses varies from institution to institution. Some colleges offer admission through the entrance test, and others through direct admission. *Use of technologies like online lectures, virtual classrooms etc. While the School of Correspondence Courses and Continuing education, at Delhi University was the first correspondence school set up in India, today there are hundreds of universities and centres of learning providing distance learning programmes. Pondicherry University offers a range of unique courses in various management programmes like human resource management, foreign trade, software marketing and financial management, while Chennai based Annamalai University is among the only universities which cover a large number of science subjects such as sugar technology, hydrology, petroleum exploration and others through distance learning. Punjab Technical University, is the first technical university in India to have introduced technical courses under the ‘distance education’ mode. In conclusion, the job market is highly competitive today and the best jobs go to those who have the required educational qualifications. Distance education in India provides a viable alternative to regular college education for millions of students. It is cheaper than a full time degree and in most cases, provides good quality, well-structured learning material. Many women, retired persons or first time learners have also found distance education very valuable. Courses on child welfare, food technology, entrepreneurship training and so on have enabled those unable to complete their education, or interested in further widening their horizons, the means to acquire the necessary qualifications for employment.